In a mixing bowl, toss oats with salt. Stir in pecans and apricots. Melt butter in a saucepan over medium low heat. As butter starts to melt and coats pan, add brown sugar and maple syrup. Heat just until brown sugar is melted and mixture starts to bubble. Turn off heat and quickly stir in vanilla. Pour butter mixture over oats and stir well until thoroughly mixed. Press tightly into lined pan. Let cool at room temperature for about an hour. 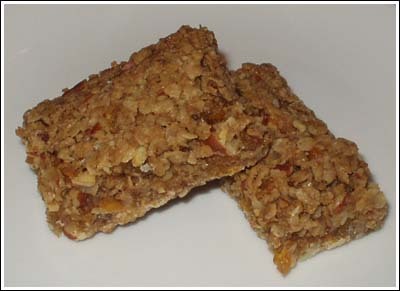 Lift parchment from pan and score into 9 bars – do not separate bars. They will seem very crumbly at this point and won’t hold together properly. Place parchment with bars back into pan and chill for a few hours. Separate bars. You may want to cut each bar in half once more to make 18 squares. These are rich! I agree, the CI books are great. I have baking illustrated, and best american recipes. I’ve been tempted by this cookie book before but was sort of leary about it. I’ll look for it next time I’m at the bookstore. Here is a link to the Cook’s Illustrated book: http://www.cooksillustrated.com/bookstore.asp You can also order it from Amazon. I have “The Best Recipe”, “Grilling” “Italian” and “Cover and Bake”. We haven’t found a bad recipe in any of them yet and some (pot pies and pasta sauces) were marvelous.The apricot bars look good!